Solve It! 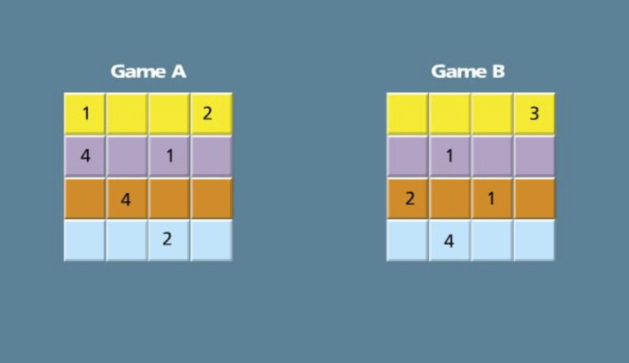 The goal of this game is to fill in the empty squares with numbers. The numbers 1, 2, 3, and 4 must appear once in each row and once in each column. Complete the games on the canvas. Problem 2 Got It? Which two statements contradict each other? Problem 2 Got It? Reasoning: Statements I and II below contradict each other. Statement III is the negation of Statement I. 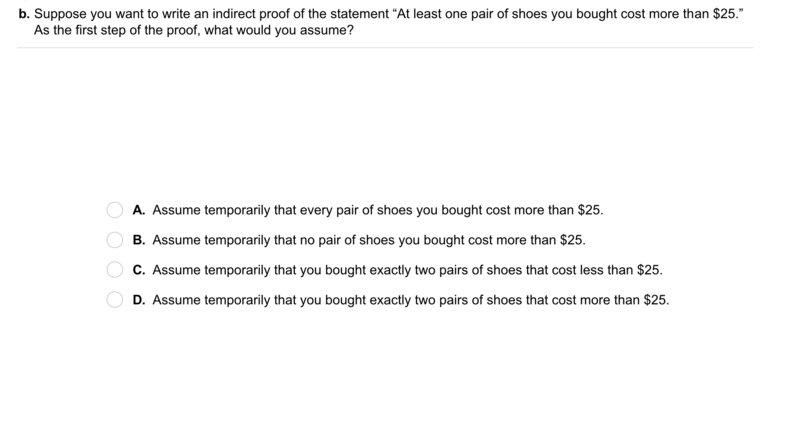 Are statements II and III equivalent? III. △ABC is not scalene. Given: 7(x + y) = 70 and x ≠ 4. Write a statement that contradicts the following statement. Draw a diagram to support your answer. Lines a and b are parallel. 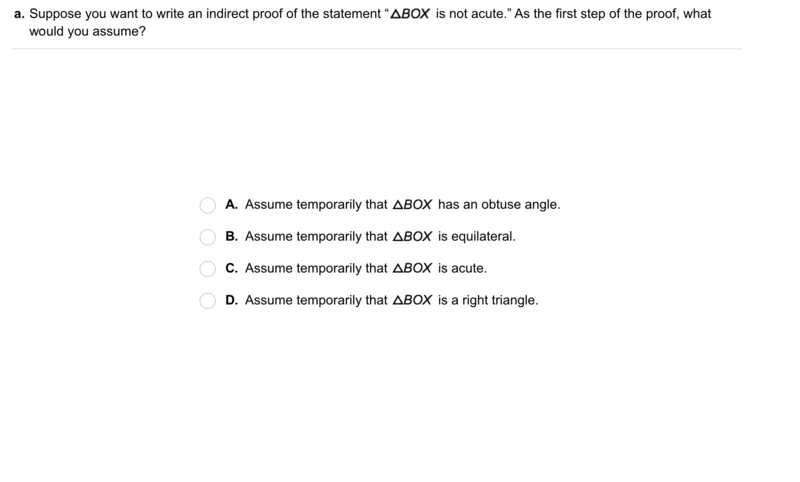 Error Analysis: A classmate began an indirect proof as shown below. Explain and correct your classmate's error. Review Lesson 5-4: The distances from the centroid of a triangle to its vertices are 16 cm, 17 cm, and 18 cm. What is the length of the shortest median? 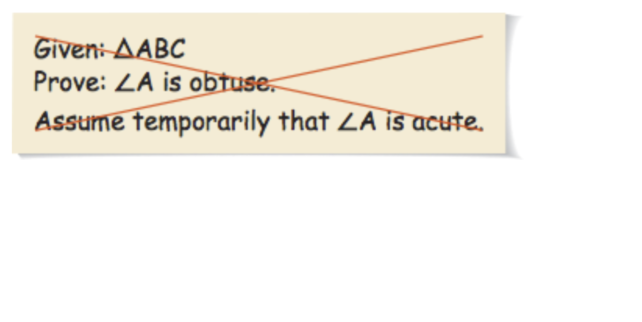 Review Lesson 5-4: The orthocenter of isosceles △ABC lies outside the triangle and m∠A = 30. What are the measures of the other two angles? Select all that apply. Review Lesson 2-4: You think, "If I leave home at 7:10, I'll catch the 7:25 bus. If I catch the 7:25 bus, I'll get to school before class starts. I am leaving and it's 7:10, so I'll get to school on time." Which law of deductive reasoning are you using? Review Lesson 1-7: Identify the shortest and longest sides of △ABC. Vocabulary Review: Draw a line from each statement in Column A to one or more pictures that contradicts it in Column B. Use Your Vocabulary: Write indirect or indirectly to complete the sentence. The __?__ way home from school takes a lot more time. Respond with one word, no spaces. By finding the negation of a statement false, you __?__ prove the statement true.